Spacewalking astronauts set up TV cameras Thursday for new crew capsules set to arrive in coming months. The International Space Station's commander, Drew Feustel, and Ricky Arnold completed the job after struggling with a balky shield for protection against space debris. They accomplished everything, but a small item managed to slip away. Feustel accidentally let go of a long, twisty wire tie as he secured one last piece of equipment, and it floated off into space. "Now I have to live with the shame of losing a wire tie," he joked. 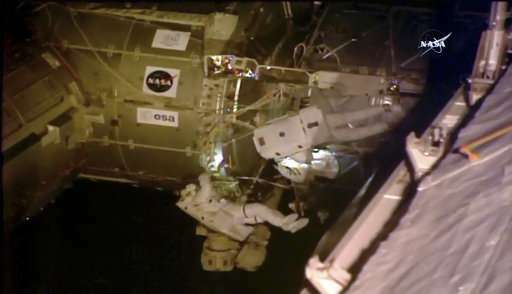 Wrapping up the ninth spacewalk of his career, Feustel moved into third place on the all-time spacewalking list, which is topped by a Russian. Altogether, Feustel has spent 61 hours and 48 minutes out in the vacuum of space. As Thursday's spacewalk got underway, Feustel had to use a small crowbar to remove a protective shield in order to hook up a new cable for the high-definition TV cameras. Arnold floated over to help complete the initial cable work. "Fantastic job," Mission Control radioed. But the NASA astronauts soon encountered more snags, slowing them down. They finally got the two high-def cameras installed on the end of 4 1/2-foot booms. The cameras are meant to provide sharp views of commercial crew capsules coming in to dock. Until SpaceX and Boeing start flying astronauts, NASA must rely solely on Russian capsules for getting to and from the 250-mile-high outpost. The Russians rides are costing NASA up to $82 million per person. NASA hasn't launched astronauts into space from U.S. soil since the last shuttle flight in 2011. SpaceX and Boeing are aiming for test flights from Cape Canaveral, Florida, by year's end. The tentative schedule shows flights without a crew by both companies in late summer followed by launches with astronauts by December. But those dates are considered optimistic. 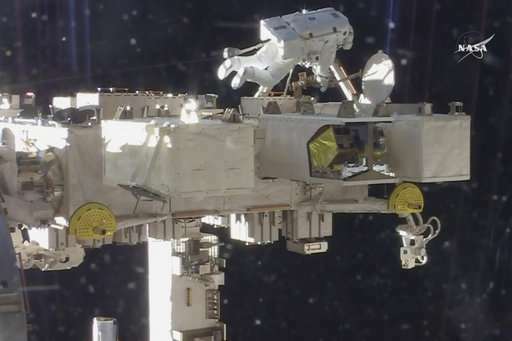 During their nearly seven-hour spacewalk, Feustel and Arnold also replaced a camera in another part of the station, closed the flapping door to a laser-firing experiment to measure clouds and tackled some extra chores. Once back inside, they both called out, "We're home!"